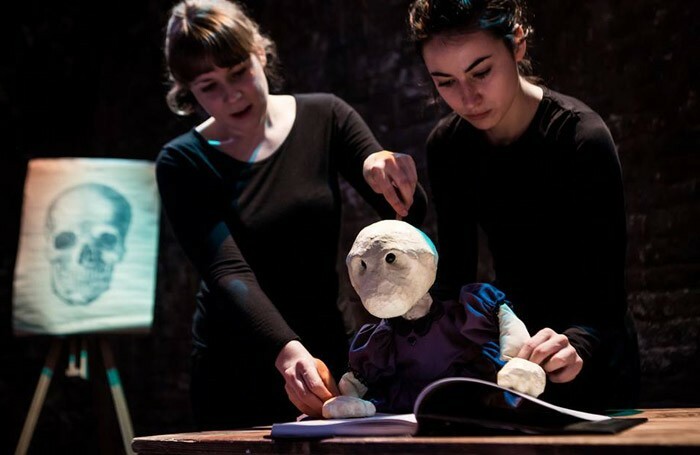 Certain Dark Things’ deceptively slight show Melancholy is an evocative mix of puppetry, performance and animation that explores the nature of grief. Stephen McCabe is a scientist left reeling by the death of his wife – driven almost to madness, he decides to rebuild her. Meanwhile, the puppet figure of a child hovers around him, left neglected by his obsession. It’s a beautifully controlled piece that uses music and Emily Knight’s gorgeously gothic animation to great effect – the film charting the couple’s relationship is as if Tim Burton remade the opening sequence of Up. McCabe gives a sensitive (unspoken) performance, and puppeteers Sarah Morgan and Laura Romer-Ormiston wring a surprising amount of pathos out of their tiny charge. The result is both moving and ultimately uplifting, an exhortation not to let mourning what you have lost make you blind to what you still have. The production is hampered by the limitations of a venue it’s not best suited for – poor sight lines mean it’s frustratingly hard to see much of the table-top puppetry from the back rows, and the carefully cultivated mood is sporadically punctured by blasts of pop music seeping in from the bars outside. But even with these distractions, it’s a thing of some loveliness.